Tucked away at 717 Flinders Street Melbourne is the Heritage listed building which is the location of the Mission to Seafarers, which includes the Flying Angel Club. In 1916, Arthur Starling the then Governor of Victoria laid its foundation stone, for a building planned to serve the needs of visiting seamen who arrived in their ships from around the world into the port of Melbourne. Nowdays the Container ship rushes into port, unloads quickly, and is off again, usually in under 24 hours. The facilities here are no longer used to the extent they were in the past, staff from the Mission take their services directly to the ships who now visit Melbourne for such a brief period. The eastern end of this site is taken up by the chapel, an absolute little gem that houses some beautiful stained glass windows, one of which is dedicated to the Armed Merchant Cruiser HMS Jervis Bay, who sacrificed herself on the 5th. of November 1940, in the defence of her convoy. Her Captain Fegan was awarded a posthumous Victoria Cross. Recently at the Mission, a volunteer whilst cleaning out some old boxes stumbled on an old jam jar, its contents from way back in the past. In 1905, the British & Foreign Sailor's Society was involved in programme events to mark the Nelson Centenary, a fund was set up known as "The Nelson Centenary Memorial Fund" and the King, who always took a great interest in this Society gave approval for his initials to be stamped upon souvenirs. Any subscribers to this fund were able to receive medals and badges for their donations and collections, eg, a donation of 5 shillings or more entitled one to a larger medal or badge, whilst a shilling and above, but less than 5 shillings produced a smaller Victory Charm or Medalet some 17 mm in diameter. From B.F.S.S. Nelson Centenary containing Victory copper, E.R. VII. 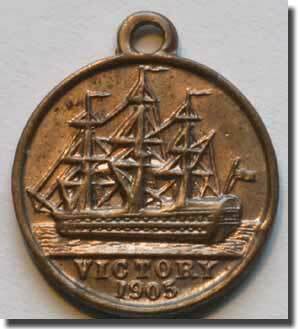 A rarer version of the medalet carries the port broadside of Victory on its obverse. The old jam jar found by our volunteer contained some of the Victory 1905 Medalets! Who knows how and why they made their way to Australia? and why they were relegated to an old jam jar, in turn stashed away in an old box. Struck 100 years ago to suddenly see the light of day, in this the 200th. Anniversary of Lord Nelson's famous victory at Trafalgar, what they might bring from collectors is of course anyone's guess. 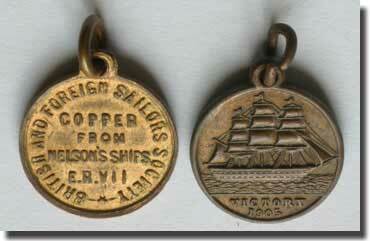 Copper from Nelson's old flagship after the Battle of the Nile, HMS Foudroyant, was also acquired and used to make HMS Victory souvenirs for girls and boys of the Empire. The ship had been named after a French Battleship captured by HMS Monmouth in May of 1758, the name meaning "Thunder and Lightning." In January 1799, Nelson took command and on the 1st. of August 1799, he entertained both Lord and Lady Hamilton on board to celebrate the first anniversary of his famous victory of The Battle of the Nile.